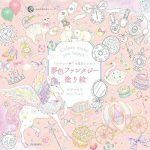 Egusa Kanoko creates coloring books for adults that evoke the warmth of childhood. You can be swept away in the enchanting whimsical scenes of adorable animals in a variety of settings. 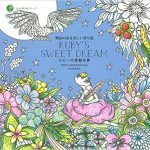 We first got to know the talented Japanese illustrator Kanoko Egusa in her first coloring book, Rhapsody in the Forest, which I reviewed earlier this year. Minuet from Happiness is described as filled with beautiful flowers and cute animals and is a wonderful follow up to Rhapsody in the Forest. The description certainly fits the book. I cannot seem to find the right color in my mind to describe the cover. It is pinkish/beige. No doubt there is a real color code name for this color. 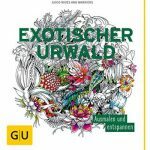 The cover nicely compliments, not only the imagery on the cover, but also its companion colouring book, Rhapsody in the Forest. Seeing them together, they have a sense of belonging, as they follow the same design theme. 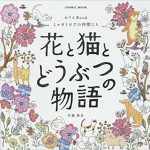 The cover is filled with the promised cute animals. There are bunnies, cats and frogs, all dressed up for a day out in the town. Surrounding this imagery are beautiful flowers and a bird in mid flight. 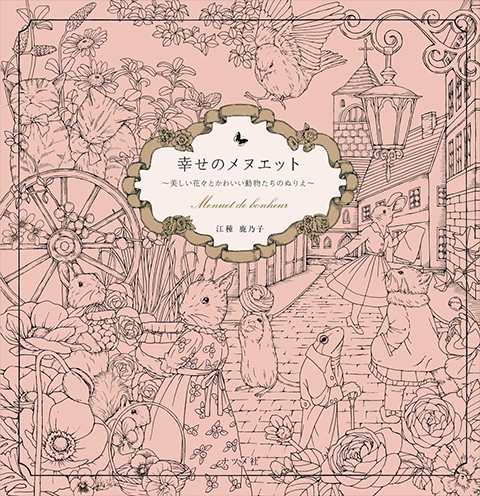 The back cover imagery has been pared back and comprises separate images of a cat with flowers and mice. A burnished gold frame surrounds the title of the book, similar to that used on Rhapsody in the Forest. I was asked through the week, what the difference is between bunnies and rabbits. I had better answer that now, before I forget! Both a bunny and a rabbit is the same thing. However, in coloring and anything cutesy, we tend to think of a bunny as a rabbit that wears clothes and behaves in a more “human” fashion, like the Easter Bunny. The cover on the dust jacket of Happiness of Minuet is very textured. You could happily color this with the medium of your choice. There is no line art on the reverse of the cover. A white card cover with a blue reverse color protects the coloring book proper. It has a simple pattern design printed in an old gold color. Throughout the pattern are tiny birds, cats, flowers and other animals. It is very pretty but perhaps a little too tiny to color in with any comfort. The book measures 21 cm x 14.8 cm (approximately 8.3 in x 5.8 in). A beautiful title page greets you when you open the book. The cuteness of the duckling and the bunny in the tea cup in a wreath surrounding the text is instantly appealing. A double page spread featuring ducklings and daffodils follows. A cute little bunny borders what is presumably copyright and publishing text information. The illustrations have been all been printed on both sides of the paper. The paper is white and medium quality. It would not withstanding alcohol markers without bleeding to the reverse, which would be a shame. It should take water based markers like tombows but do check first discreetly on the title page. There are 18 double page scenes throughout the book with the balance of illustrations on one page. If you are a lover of the whimsical and cute, as I am, this book will enchant you. The delicate hand that has inked these adorable animals provides not only a massive dose of cute but also a realism about the drawings. These animals are so life like you could almost imagine that there is another little parallel fantasy world near you, where this really does happen. Menuet De Bonheur seems to have a theme of family and love about it. Google translate has not been of much assistance in this regard so I’m basing this assumption off the imagery. The lovely huddle of kittens (baby rabbits) with their bunny parents watching over them, the family of cats tending to their kittens, goats and their kids, ducklings, a bird and its chicks. All of themes images speak to the importance of love, nurture and family. Finally, spoiler alert, it all culminates in a beautiful bunny wedding! The bunny wedding includes the preparation, the guests and the Church. Divine. 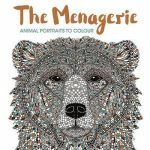 As well as the beautiful and so very cute animals in this colouring book there is also an abundance of florals. We have been given a huge variety including daisies, roses, daffodils and lilies. 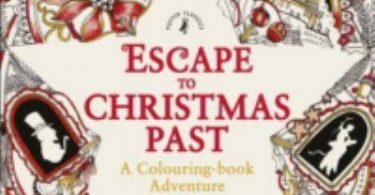 There are other elements to color as well like food, interiors, woodland scenes, seaside settings, gifts and even a Halloween scene. Naturally, all of this activity must be exhausting for cute little bunnies and what not, so they need a holiday. Yes, there’s even a world map, some kimono outfits and a Paris setting. A beautiful array of gifts and a lovely painter bunny! This is a true “story book” style coloring book. The double page spreads are needed to help the illustrative story evolve. Within these images flows a beautiful theme that finishes with a very traditional happy ending. I think someone has sprinkled this book with a little magic fairy dust, because it certainly has given me more than a minute of happiness so far. The line weight is fine and delicate and has been printed in a dull black. Other lines and detail have been added to animals, primarily for texture and dimension. All of the images have been orientated portrait style. Some of the illustrations do run to the spine. 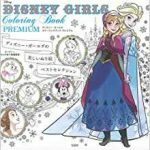 However, the binding of this book is wonderful, it is very easy to lay the book down flat to color in any tricky areas. The bulk of the illustrations fill the whole of the page. Within each image, there are elements that have larger spaces giving relief to colorists who have discomfort from coloring tightly packed detail. There are some illustrations with finer detail. If you have any minor visual impairment you may want to grab your magnifying lamp for these, and just color a little at a time. The bulk of the images in the book should not present an issue for most colorists. 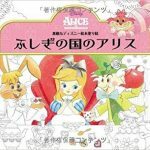 As is often the way with Japanese coloring books that we have seen, there is a little treat at the back of the book. There are two lovely postcards first of all, featuring a galah and a bunny. 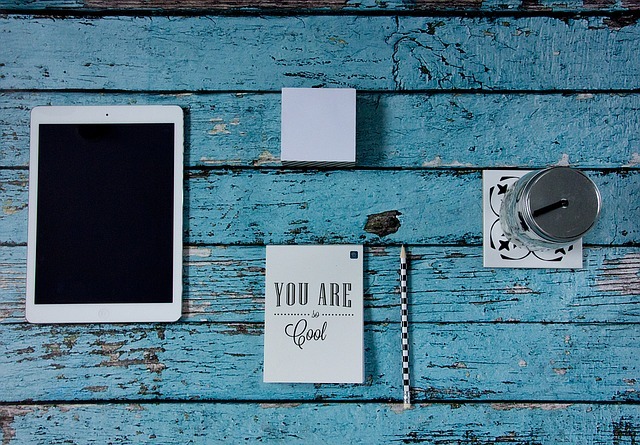 They are printed on medium quality kraft style paper. Another page features 5 gift tags or ornaments that you can press out and color. They are printed on the same style Kraft paper with perforations. They feature a variety of cute little animals with other elements. 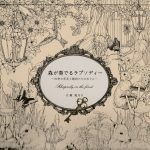 I will update this post as more suppliers stock the gorgeous Minuet From Happiness Coloring Book by Kanoko Egusa. See my Pinterest board for completed pages from Menuet De Bonheur for coloring inspiration. If you have not seen her first book, Rhapsody in the Forest – I have reviewed it here. Kanoko Egusa is a Japanese designer and illustrator. 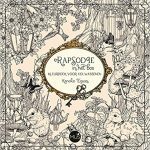 Her first coloring book for adults, Rhapsody in the Forest enchanted us with delightful animals dressed up. Her work is whimsical and sweet while being very detailed and realistic. A lovely book. The beautiful anthropomorphic animal families remind me of The Day We Finally Meet. I live in the US and bought mine from YesAsia for $18.56. Received it in about 2 weeks. Love it!! Oh. I forgot to say I ordered 2 coloring books for the same price and got free shipping. Forgot to say that shipping was free because I also ordered Romantic Country the third tale at the same time. C bell, YesAsia? I had not heard of that before. You’ve had good luck with this website (I’m assuming website)? I’ll have to look into that. Thank you for the info. Beautiful book. Another “must have”. You do know that I blame any coloring book purchase on you. I tell my boyfriend that you force me to buy each book. 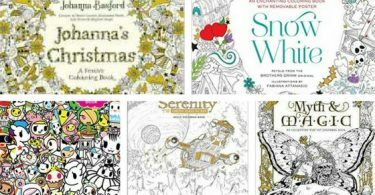 So, if you ever get an ugly email about forcing people to buy coloring books, well….my apologies in advance. Lol No, he’s actually supportive, very supportive. 🙂 your explanation on the difference between a bunny and a rabbit was great! I always just thought a bunny was a baby rabbit. Lol. Now I know! 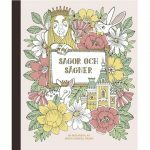 Ps: do you know about the coloring book everyone is calling Ms. Rabbit? It’s japanese, I think, but maybe Korean. I’ve seen pictures (especially on Pinterest) but have not seen the cover to know what to look for. Haha, he really doesn’t mind! :). Yes, I think your hubby might enjoy it if he tried it. Brad will often pick a color and “help” with some of the details that, as he says, “might be too little or to hard for you to do” (I have chronic pain, arthritis, and health issues). These “little/hard” spots often evolve into half of a page or more. Lol. so, you do know about the rabbit girl book! Do you have a copy? Could you post a pic of the cover if you’ve got a copy, and maybe where you purchased it? Or even just the actual name of the book if you know it? I’ve tried looking and googling, but can’t seem to find what the book might actually be (as I said, I’ve only seen some of the inside pages on Pinterest). Thanks. I love rabbits too. Lol at the moment I’ve got my hubby “coloring” the house aka painting it 🙂 He won’t have time to help me with the fiddly bits – like you I have troubles with that 😉 Bunny book is on its way to me. I tried a new supplier so I’m crossing fingers and what not that it is reputable. If it turns out to be all good then the links will be posted and it will be reviewed quickly 🙂 I adore bunnies! I’ve also got another super cute sorta bunny book on its way …it’s adorable! Thanks! I’ll keep an eye out. Happy coloring-to you and hubby both. Hello. You said that the book will be available in the U.S. in December? The link provided takes me to Amazon for the book available now but with a 30.00 price tag sold by a Japanese third party seller. Is this the edition you were referring to or is there a U.S. version coming out in December? 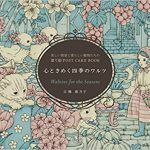 I may just have to purchase from Amazon Japan which is much cheaper even with shipping as I decided to do with “Rhapsody in the Forest.” Thanks for your reviews and thanks in advance for your reply. It is greatly appreciated. Hi Luann, The third party seller doesn’t have it in stock until December. 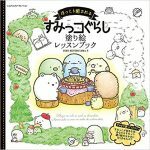 No US publisher has picked up rights to this book as yet 🙁 so it is either the third party seller on AZ, Etsy,Ebay, Amazon Japan or YesAsia.com (which offers free shipping when you purchase a certain amount). When I looked on YesAsia last week they also had a special where you could get Rhapsody and Menuet for a good price. On the AUD$ it is cheaper for me to buy from AZ JP which is where I purchased my copy. Hope that helps. 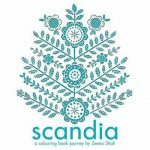 Kinokuniya.com (aka bookweb USA has both of this author’s books plus all of the romantic country, the econeco book, and so, so much more. 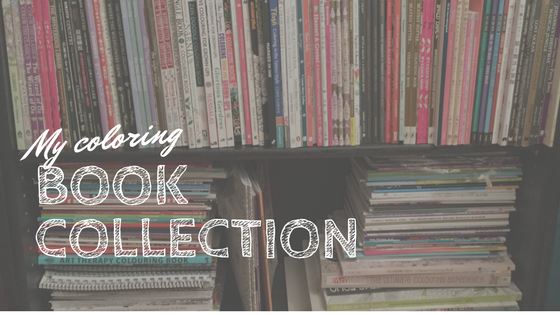 Delivery is free with a purchase of $50, or a flat fee of 8 (no matter how many books) if less than $50. I just ordered, so I don’t know how it’ll go, but I’m hopeful it will be good, as I’ve heard people say the things they’ve ordered have been fine. Thought I’d throw this out there, in case anyone doesn’t want to order from Amazon Japan or etsy with their quite expensive shipping. Reminds me of Beatrix Potter- Peter Rabbit, The floppsy bunnies, Mrs Tiggywinkle, Jeremy Fisher etc. I <3 it, more than the first one as there are more bunnies in this one ....and I'm bunny mad!